Assignments. Air Force Combat Command (later, Army Air Forces), 1 Sep 1941; United States Army Forces in the Middle East, 12 Nov 1942; European Theater of Operations, United States Army, 3 Nov 1943; United States Strategic Air Forces in Europe (later, United States Air Forces in Europe), 22 Feb 1944-2 Dec 1945. Tactical Air Command, 28 Mar 1946; Continental Air Command, 1 Dec 1948; Tactical Air Command, 1 Dec 1950; Air Combat Command, 1 Jun 1992-. Major Components. Commands. IX Air Defense: 1 Jul 1944-28 Nov 1945. IX Air Support (later, IX Tactical Air): 4 Dec 1943-17 Aug 1945. IX Engineer: 1 Jul 1944-2 Dec 1945. IX Fighter: 23 Dec 1942-16 Nov 1945. IX Troop Carrier: 16 Oct 1943-25 Aug 1944. XIX Air Support (later, XIX Tactical Air): 4 Jan 1944-4 Aug 1945. XXIX Air Support (later, XXIX Tactical Air): 1 Jul-3 Oct 1945. Divisions. 12 Air: 23 Feb- 27 Jun 1949. 19 Air (formerly, 19 Bombardment Wing; IX Bomber Command; 9 Bombardment Division; 9 Air Division; 19 Bombardment Wing): 24 Jul 1942-20 Nov 1945; 22 Dec 1948-1 Feb 1949. 21 Air: 22 Dec 1948-1 Feb 1949. 42 Air: 1 Jul-1 Oct 1957. 49 Air: 22 Dec 1948-1 Feb 1949. 69 Air: 23 Feb-27 Jun 1949. 302 Air: 22 Dec 1948-1 Feb 1949. 833 Air: 1 Oct 1964-24 Dec 1969. 834 Air: 25 Sep-1 Oct 1957; 1 Jul 1964-15 Oct 1966. 836 Air: 8 Oct 1957-1 Jul 1961; 1 Jul 1962-30 Jun 1971. 837 Air: 8 Feb 1958-1 Feb 1963. 838 Air: 25 Sep-11 Dec 1957. 839 Air: 8 Oct 1957-1 Jul 1963; 9 Nov 1964-1 Dec 1974. 840 Air: 1 Oct 1964-24 Dec 1969. Stations. Bowman Field, KY, 1 Sep 1941; New Orleans AAB, LA, 24 Jan 1942; Bolling Field, DC, 22 Jul-Oct 1942; Cairo, Egypt, 12 Nov 1942-Oct 1943; Sunnyhill Park, England, Nov 1943-Sep 1944; Chantilly, France, 15 Sep 1944; Bad Kissingen, Germany, 6 Jun-2 Dec 1945. Biggs Field, TX, 28 Mar 1946; Greenville AAB (later, AFB), SC, 31 Oct 1946; Langley AFB, VA, 14 Feb 1949; Pope AFB, NC, 1 Aug 1950; Shaw AFB, SC, 20 Aug 1954-. Operations. Involved in early training activities for air-ground support operations from the fall of 1941 through the spring of 1942, but essentially unmanned during the summer of 1942 when most personnel were reassigned to Twelfth Air Force. Small cadre moved to Egypt and began operations upon assuming the personnel, units and resources of the provisional U.S. Army Middle East Air Force in Nov 1942; participated in the Allied drive across Egypt and Libya, the campaign in Tunisia, and the invasions of Sicily and Italy. Moved to England in Oct 1943 to become the tactical air force for the invasion of the European Continent. Helped prepare for the assault on Normandy, supported operations in the beachhead during June 1944, and through its advanced headquarters took part in the drive that carried the Allies across France and culminated in victory over Germany in May 1945. Assigned to Tactical Air Command until Dec 1948 when the Ninth, reassigned to Continental Air Command, lost its role as a tactical air organization and became concerned chiefly with reserve and National Guard units and activities. Assigned to Tactical Air Command in Dec 1950 and became concerned primarily with tactical air operations and training. 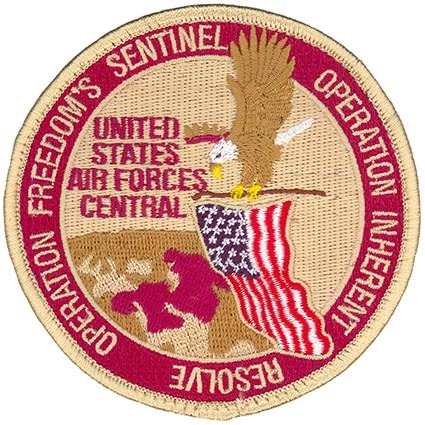 Since 1983, headquarters served in a joint-force capacity as U.S. Central Command Air Forces (later, Air Forces Central) responsible for contingency air operations in Southwest Asia, namely as primary air command element during Operations Desert Shield and Desert Storm in 1990-1991, and later during Operation Enduring Freedom beginning in 2001 and Operation Iraqi Freedom beginning in 2003. Service Streamers. WWII American Theater. Campaign Streamers. World War II: Egypt-Libya; Tunisia; Sicily; Normandy; Northern France; Rhineland; Ardennes-Alsace; Central Europe. Southwest Asia: Defense of Saudi Arabia; Liberation and Defense of Kuwait; Southwest Asia Ceasefire. Decorations. Air Force Outstanding Unit Awards: 1 Jun 1986-31 May 1988; 1 Jul 1996-31 Mar 1998; 1 Jun 1998-31 May 2000; 1 Jun 2000-31 May 2002; 1 Jun 2004-31 May 2006; 1 Jun 2006-31 May 2007; 1 Jun 2007-31 May 2008; 1 Jun 2008-31 May 2009. Air Force Organizational Excellence Award: 4 Aug 1990-11 Apr 1991. Emblem. Approved on 16 Sep 1943; revised on 14 Sep 1951; AFCENT alternate emblem originally approved on 9 Apr 1987; newest rendition on 30 Jun 2008.